Everyone’s vision changes over time, your best chance of keeping your eyes in the best possible condition is with regular eye tests. How often you have an eye check depends on your age and visual requirements. The Department of Health recommend once every two years for healthy adults, with more frequent tests for children, people over 70, and those with conditions such as diabetes, glaucoma and macular degeneration. We advise you on the right interval at your appointment. At Opticks Opticians there is much more to an eye test than just checking if you need new glasses or contact lenses. We also carry out a detailed assessment of the health of your eyes to make sure you don’t have hidden conditions that could affect your future vision if not treated in time. 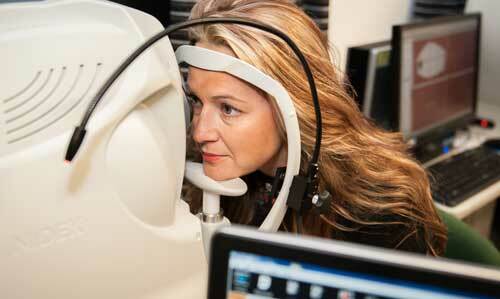 This includes the option of having an OCT 3D retinal screening scan. The OCT screening provides exquisite details of the retinal microstructures to assist in early detection, diagnosis and monitoring of retinal diseases including glaucoma, diabetic retinopathy, age related macular degeneration, retinal detachments and a great deal more.